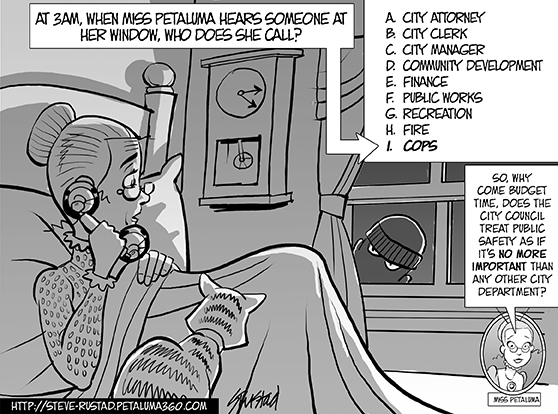 Gee it’s tough being a Petaluma City Councilperson, so many activists to placate, constituents to coddle and issues to straddle. And of course, in this climate of diminished revenues (let’s not trouble ourselves as to why revenues are diminished), all city departments have to share the pain equally. No favorites. Easy-peesy. The council has the appearance of being fair-minded and no public interest group can accuse the city fathers and mothers of favoritism. Or, for that matter, leadership, because leadership would require prioritization. And prioritization would certainly rankle someone.